a dotplot of the array, that takes into account the array design. This is a crucial tool in the case of array-CGH data normalization for two reasons: first it provides an easy way to identify spatial artifacts such as row, column, print-tip group effects, as well as spatial bias and spatial gradients on the array; then it allows a post-normalization control, to ensure that the normalization procedure reached its goals, i.e. significantly reduced the observed effects. a plot of the signal values along the genome, which gives a visual impression of the array quality on the edge of biological relevance; comparing the signal shape before and after normalization provides a qualitative idea of the imrpovement in data quality provided by the normalization method. 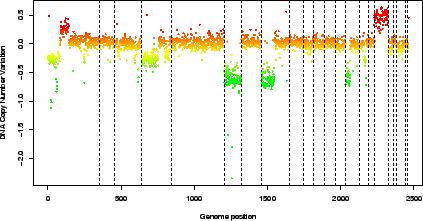 the report.plot method successively calls arrayPlot and genome.plot in order to provide a simultaneous vision of the data using the two relevant metrics (array and genome), with approproate color scales. 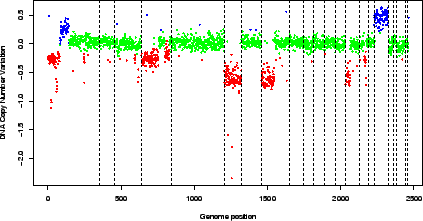 Figure 3: Pan-genomic profile of the array. Colors are proportional to log-ratio values. if the variable is not numeric (e.g. the copy number variation as estimated by GLAD, or a character variable making the disitnction between flagged and un-flagged clones), the function counts the number of modalities of the variable and defines an appropriate color scale using the rainbow function (figure 4). Figure 4: Pan-genomic profile of the array. Colors correspond to the values of the variable ``ZoneGNL''. This method successively calls arrayPlot and genome.plot; it checks for color scale consistency between plots, and can automatically set the plot layout (figure 5). 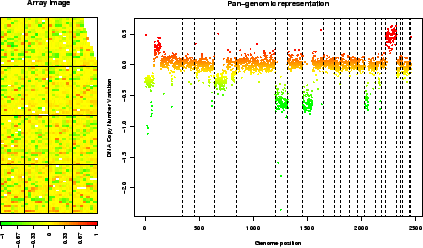 Figure 5: report.plot: array image and pan-genomic profile after normalization.